Josephine Pender with a photograph of her missing daughter, Fiona. The mother of a missing Offaly woman Fiona Pender fears she will die before the remains of her daughter and unborn grandchild are located. Ms Pender, a 25-year-old hairdresser, disappeared from her flat on Church Street in Tullamore on August 22, 1996. She was seven months pregnant at the time. She will be remembered at the first annual 'Fiona's Way' walk along the Grand Canal in Tullamore tomorrow. 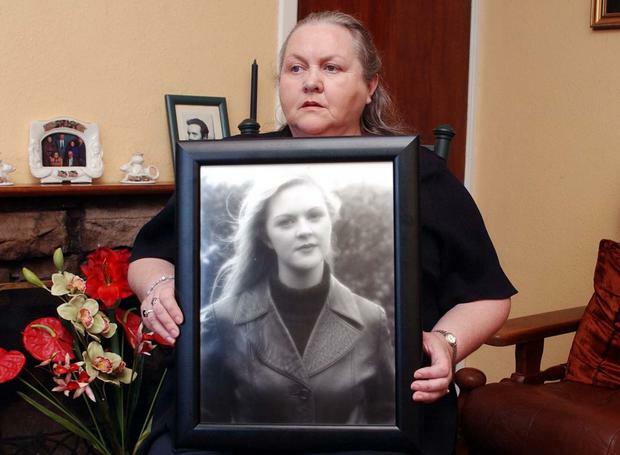 Speaking on the 18th anniversary of her disappearance yesterday, Fiona's heartbroken mother Josephine (65) said: "I would have hoped to have found Fiona before I die but I have been very ill this year." In recent months Mrs Pender has been in and out of hospital having suffered a mini stroke, lung infections and pneumonia. "I've been very sick for the last few months… the doctors are putting it down to stress," she explained. "It's hard to keep going as the years go on." While she has given up hope of finding them alive, Mrs Pender wants her daughter and grandchild to have a proper christian burial. "I would appeal to people who know out there, just please tell me where she is," she said. Following a lengthy campaign, including a petition containing almost 13,000 signatures, a 4.5km looped walk along the Grand Canal was named Fiona's Way last May. "It's something to remember her," said Mrs Pender.